These rules govern proceedings in all courts in the State of Colorado, to the extent and with the exceptions stated in Rule 1101. (2) Offer of proof. In case the ruling is one excluding evidence, the substance of the evidence was made known to the court by offer or was apparent from the context within which questions were asked. Once the court makes a definitive ruling on the record admitting or excluding evidence, either at or before trial, a party need not renew an objection or offer of proof to preserve a claim of error for appeal. (b) Record of offer and ruling. The court may add any other or further statement which shows the character of evidence, the form in which it was offered, the objection made, and the ruling thereon. It may direct the making of an offer in question and answer form. (e) Weight and credibility. This rules does not limit the right of a party to introduce before the jury evidence relevant to weight or credibility. When a writing or recorded statement or part there of is introduced by a party, an adverse party may require him at that time to introduce any other part or any other writing or recorded statement which ought in fairness to be considered contemporaneously with it. (b) Kinds of facts. A judicially noticed fact must be one not subject to reasonable dispute in that it is either (1) generally known within the territorial jurisdiction of the trial court, or (2) capable of accurate and ready determination by resort to sources whose accuracy cannot reasonably be questioned. In all civil actions and proceedings not otherwise provided for by statute or by these rules, a presumptions imposes upon the party against whom it is directed the burden of going forward with evidence to rebut or meet the presumption, but does not shift to such party the burden of proof in the sense of the risk of non-persuasion, which remains throughout the trial upon the party on whom it was originally cast. 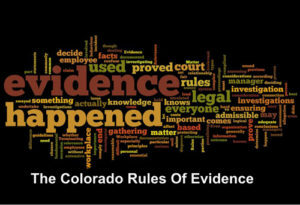 All relevant evidence is admissible, except as otherwise provided by the Constitution of the United States, by the Constitution of the State of Colorado, by these rules, or by other rules prescribed by the Supreme Court or by the statutes of the State of Colorado. Evidence which is not relevant is not admissible. (b) Other crimes, wrongs, or acts. Evidence of other crimes, wrongs, or acts is not admissible to prove the character of a person in order to show that he acted in conformity therewith. It may, however, be admissible for other purposes, such as proof of motive, opportunities, intent, preparation, plan, knowledge, identity, or absence of mistake or accident. (b) Specific instances of conduct. Except as limited by § 16-10-301 and 18-3-407, C.R.S. 1973 (Volume 8, 1978 Repl. Vol. ), in cases in which character or a trait of character of a person is an essential element of a charge, claim or defense, proof may also be made of specific instances of his conduct. When after an event, measures are taken which, if taken previously, would have made the event less likely to occur, evidence of the subsequent measures is not admissible to prove negligence or culpable conduct in connection with the event. This rule does not require the exclusion of evidence of subsequent measures when offered for another purpose, such as proving ownership, control, or feasibility of precautionary measures, if controverted, or impeachment. Except as otherwise provided by statutes of the State of Colorado, evidence of a plea of guilty, later withdrawn, or a plea of nolo contendere, or of an offer to plead guilty or nolo contendere to the crime charged or any other crime, or of statements made in any connection with any of the foregoing pleas or offers, is not admissible in any civil or criminal action, case, or proceeding against the person who made the plea or offer. This rule shall not apply to the introduction of voluntary and reliable statements made in court on the record in connection with any of the foregoing pleas or offers where offered for impeachment purposes or in a subsequent prosecution of the declarant for perjury or false statement. Every person is competent to be a witness except as otherwise provided in these rules or in any statute of the State of Colorado. The judge presiding at the trial may not testify in that trial as a witness. No objection need be made to preserve the point. (a) At the trial. A member of the jury may not testify as a witness before that jury in the trial of the case in which he is sitting as a juror. No objection need be made in order to preserve the point. (b) Inquiry into validity of verdict or indictment. Upon an inquiry into the validity of a verdict or indictment, a juror may not testify as to any matter or statement occurring during the course of the jury’s deliberations or to the effect of anything upon his or any other juror’s mind or emotions as influencing him to assent to or dissent from the verdict or indictment or concerning his mental processes in connection therewith, except that a juror may testify on the question whether extraneous prejudicial information was improperly brought to the jurors’ attention or whether any outside influence was improperly brought to bear upon any juror. Nor may his affidavit or evidence of any statement by him concerning a matter about which he would be precluded from testifying be received for these purposes. The credibility of a witness may be attacked by any party, including the party calling him. Leading questions may be used for the purpose of attacking such credibility. (b) Specific instances of conduct. Specific instances of the conduct of a witness, for the purpose of attacking or supporting his credibility, other than conviction of crime as provided in 13-90-101, C.R.S. 1973, may not be proved by extrinsic evidence. They may, however, in the discretion of the court, if probative of truthfulness or untruthfulness, be inquired into on cross-examination of the witness (1) concerning his character for truthfulness or untruthfulness, or (2) concerning the character for truthfulness or untruthfulness of another witness as to which character the witness being cross-examined has testified. § 13-90-101. Who may testify – interest. All persons, without exception, other than those specified in sections 13-90-102 to 13-90-108 may be witnesses. Neither parties nor other persons who have an interest in the event of an action or proceeding shall be excluded; nor those who have been convicted of crime; nor persons on account of their opinions on matters of religious belief. In every case the credibility of the witness may be drawn in question, as now provided by law, but the conviction of any person for any felony may be shown for the purpose of affecting the credibility of such witness. The fact of such conviction may be proved like any other fact, not of record, either by the witness himself, who shall be compelled to testify thereto, or by any other person cognizant of such conviction as impeaching testimony or by any other competent testimony. Evidence of a previous conviction of a felony where the witness testifying was convicted five years prior to the time when the witness testifies shall not be admissible in evidence in any civil action. Evidence of the beliefs or opinions of a witness on matters of religion is not admissible for the purposes of showing that by reason of their nature his credibility is impaired or enhanced. (c) Leading questions. Leading questions should not be used on the direct examination of a witness except as may be necessary to develop his testimony. Leading questions should be permitted on cross-examination. When a party calls a hostile witness, and adverse party, or a witness identified with an adverse party, interrogation may be by leading questions. the court in its discretion determines it is necessary in the interests of justice, an adverse party is entitled to have the writing produced at the hearing, to inspect it, to cross-examine the witness thereon, and to introduce in evidence those portions which relate to the testimony of the witness. If it is claimed that the writing contains matters not related to the subject matter of the testimony the court shall examine the writing in camera, excise any portions not so related, and order delivery of the remainder to the party entitled thereto. Any portion withheld over objections shall be preserved and made available to the appellate court in the event of an appeal. If a writing is not produced or delivered pursuant to order under this rule, the court shall make any order justice requires, except that in criminal cases when the prosecution elects not to comply, the order shall be one striking the testimony, or, if the court in its discretion determines that the interests of justice so require, declaring a mistrial. (a) Examining witness concerning prior inconsistent statements for impeachment purposes. Before a witness may be examined for impeachment by prior inconsistent statement the examiner must call the attention of the witness to the particular time and occasion when, the place where, and the person to whom he made the statement. As a part of that foundation, the examiner may refer to the witness statement to bring to the attention of the witness any purported prior inconsistent statement. The exact language of the prior statement may be given. Where the witness denies or does not remember making the prior statement, extrinsic evidence, such as deposition, proving the utterance of the prior evidence is admissible. However, if a witness admits making the prior statement, additional extrinsic evidence that the prior statement was made is inadmissible. Denial or failure to remember the prior statement is a prerequisite for the introduction of extrinsic evidence to prove that the prior inconsistent statement was made. (a) Calling by court. The court may, on its own motion or at the suggestion of a party, call witnesses and all parties are entitled to cross-examine witnesses thus called. At the request of a party the court shall order witnesses excluded so that they cannot hear the testimony of other witnesses, and it may make the order of its own motion. This rule does not authorize exclusion of (1) a party who is a natural person, or (2) an officer or employee of a party which is not a natural person designated as its representative by its attorney, or (3) a person whose presence is shown by a party to be essential to the presentation of his cause. If the witness is not testifying as an expert, the witness¹ testimony in the form of opinions or inferences is limited to those opinions or inferences which are (a) rationally based on the perception of the witness, (b) helpful to a clear understanding of the witness¹ testimony or the determination of a fact in issue, and (c) not based on scientific, technical or other specialized knowledge within the scope of Rule 702. (a) Appointment. The court may on its own motion or on the motion of any party enter an order to show cause why expert witnesses should not be appointed, and may request the parties to submit nominations. The court may appoint any expert witnesses agreed upon by the parties, and may appoint expert witnesses of its own selection. Any expert witness shall not be appointed by the court unless he consents to act. A witness so appointed shall be informed of his duties by the court in writing, a copy of which shall be filed with the clerk, or at a conference in which the parties shall have opportunity to participate. A witness so appointed shall advise the parties of his findings, if any; his deposition may be taken by any party; and he may be called to testify by the court or any party. He shall be subject to cross-examination by each party, including a party calling him as a witness. (b) Compensation. Expert witnesses so appointed are entitled to reasonable compensation in whatever sum the court may allow. The compensation thus fixed is payable from funds which may be provided by law in criminal cases and civil actions and proceedings involving just compensation under the fifth amendment. In other civil actions and proceedings the compensation shall be paid by the parties in such proportion and at such time as the court directs, and thereafter charged in like manner as other costs. (d) Parties’ experts of own selection. Nothing in this rule limits the parties in calling expert witnesses of their own selection. (a) Statement. A “statement” is (1) an oral or written assertion or (2) nonverbal conduct of a person, if it is intended by him to be communicative. (c) Hearsay. “Hearsay” is a statement other than one made by the declarant while testifying at the trial or hearing, offered in evidence to prove the truth of the matter asserted. (2) Admission by party-opponent. The statement is offered against a party and is (A) the party’s statement in either an individual or a representative capacity or (B) a statement of which the party has manifested his adoption or belief in its truth; of (C) a statement by a person authorized by the party to make a statement concerning the subject; or (D) a statement by the party’s agent or servant concerning a matter within the scope of the agency or employment, made during the existence of the relationship, or (E) a statement by a co-conspirator of a party during the course and in furtherance of the conspiracy. The contents of the statement shall be considered but are not alone sufficient to establish the declarant’s authority under subdivision (C), the agency or employment relationship and scope thereof under subdivision (D), or the existence of the conspiracy and the participation therein of the declarant and the party against whom the statement is offered under subdivision (E). Hearsay is not admissible except as provided by these rules or by the civil and criminal procedural rules applicable to the courts of Colorado or by any statutes of the State of Colorado. (1) Spontaneous present sense impression. A spontaneous statement describing or explaining an event or condition made while the declarant was perceiving the event or condition. (4) Statements for purposes of medical diagnosis. Statements made for purposes of medical diagnosis or treatment and describing medical history, or past or present symptoms, pain, or sensations, or the inception or general character of the cause or external source thereof insofar as reasonably pertinent to diagnosis or treatment. (5) Recorded recollection. A past recollection recorded when it appears that the witness once had knowledge concerning the matter and; (A) can identify the memorandum or records, (B) adequately recalls the making of it at or near the time of the event, either as recorded by the witness or by another, and (C) can testify to its accuracy. The memorandum or record may be read into evidence but may not itself be received unless offered by an adverse party. (6) Records of regularly conducted activity. A memorandum, report, record, or data compilation, in any form, of acts, events, conditions, opinions, or diagnosis, made at or near the time by, or from information transmitted by, a person with knowledge, if kept in the course of a regularly conducted business activity, and if it was the regular practice of that business activity to make the memorandum, report, record, or data compilation, all as shown by the testimony of the custodian or other qualified witness, unless the source of information or the method or circumstances of preparation indicate a lack of trustworthiness. The term “business” as used in this paragraph includes business, institution, association, profession, occupation, and calling of every kind, whether or not conducted for profit. (8) Public records and reports. Unless the sources of information or other circumstances indicate lack of trustworthiness, records, reports, statements, or date compilations in any form, of public offices or agencies, setting forth (A) the activities of the office or agency, or (B) matters observed pursuant to duty imposed by law as to which matters there was a duty to report excluding, however, in criminal cases matters observed by police officers and other law enforcement personnel, or (C) in civil actions and proceedings and against the Government in criminal cases, factual findings resulting from an investigation made pursuant to authority granted by law. (9) Records of vital statistics. Records or date compilations, in any form, or births, fetal deaths, deaths, or marriages, if the report thereof was made to a public office pursuant to requirements of law. (10) Absence of public record or entry. To prove the absence of a record, report, statement, or data compilation, in any form or the non-occurrence or nonexistence of a matter of which a record, report, statement, or data compilation, in any form, was regularly made and preserved by a public office or agency, evidence in the form of a certification in accordance with Rule 902, or testimony, that diligent search failed to disclose the record, report, statement, or data compilation, or entry. (12) Marriage, baptismal, and similar certificates. Statements of fact contained in a certificate that the maker performed a marriage or other ceremony or administered a sacrament, made by a clergyman, public official, or other person authorized by the rules of practices of a religious organization or by law to perform the act certified, and purporting to have been issued at the time of the act or within a reasonable time thereafter. (14) Records of documents affecting an interest in property. The record of a document purporting to establish or affect an interest in property, as proof of the content of the original recorded or filed document and its execution and delivery by each person by whom it purports to have been executed, if the record is a record of a public office and an applicable statute authorizes the recording of documents of that kind in the office. (15) Statements in documents affecting an interest in property. A statement contained in a document purporting to establish or affect an interest in property if the matter stated was relevant to the purpose of the documents, unless dealings with the property since the document was made have been inconsistent with the truth of the statement or the purport of the document. (18) Learned treatises. To the extent called to the attention of an expert witness upon cross-examination or relied upon by him in direct examination, statements contained in published treatises, periodicals, or pamphlets on a subject of history, medicine, or other science or art, established as a reliable authority by the testimony or admission of the witness or by other expert testimony or by judicial notice. If admitted, the statements may be read into evidence and may be received as exhibits, as the court permits. (19) Reputation concerning personal or family history. Reputation among members of his family by blood, adoption, or marriage, or among his associates, or in the community, concerning a person’s birth, adoption, marriage, divorce, death, legitimacy, relationship by blood, adoption, or marriage, ancestry, or other similar fact of his personal or family history. (21) Reputation as to character. Reputation of a person’s character among his associates or in the community. (22) Judgment of previous conviction. Evidence of a final judgment, entered after a trial or upon a plea of guilty or nolo contendere, adjudging a person guilty of a crime punishable by death or imprisonment in excess of one year, to prove any fact essential to sustain the judgment, but not including, when offered by the Government in a criminal prosecution for purposes other than impeachment, judgments against persons other than the accused. The pendency of an appeal may be shown but does not affect admissibility. (5) is absent from the hearing and the proponent of a statement has been unable to procure his attendance (or in the case of a hearsay exception under subdivision (b)(3) or (4) his attendance or testimony) by process or other reasonable means. A declarant is not unavailable as a witness if his exemption, refusal, claim of lack of memory, inability, or absence is due to the procurement or wrongdoing to the proponent of his statement for the purpose of preventing the witness from attending or testifying. (3) Statement against interest. A statement which was at the time of its making so far contrary to the declarant’s pecuniary or proprietary interest, or so far tended to subject him to civil or criminal liability, or to render invalid a claim by him against another, that a reasonable man in his position would not have made the statement unless he believed it to be true. A statement tending to expose the declarant to criminal liability and offered to exculpate the accused is not admissible unless corroborating circumstances clearly indicate the trustworthiness of the statement. A statement not specifically covered by Rule 803 or 804 but having equivalent circumstantial guarantees of trustworthiness, is not excluded by the hearsay rule, if the court determines that (A) the statement is offered as evidence of a material fact; (B) the statement is more probative on the point for which it is offered than any other evidence which the proponent can procure through reasonable efforts; and (C) the general purposes of these rules and the interests of justice will best be served by admission of the statement into evidence.. However, a statement may not be admitted under this exception unless the proponent of it makes known to the adverse party sufficiently in advance of the trial or hearing to provide the adverse party with a fair opportunity to prepare to meet it, the proponent’s intention to offer the statement and the particulars of it, including the name and address of the declarant. (2) Non-expert opinion on handwriting. Non-expert opinion as to the genuineness of handwriting, based upon familiarity not acquired for purposes of the litigation. (6) Telephone conversations. Telephone conversations, by evidence that a call was made to the number assigned at the time by the telephone company to a particular person or business, if (A) in the case of a person, circumstances, including self-identification, show the person answering to be the one called, or (B) in the case of business, the call was made to a place of business and the conversation related to business reasonably transacted over the telephone. (7) Public records or reports. Evidence that a writing authorized by law to be recorded or filed and in fact recorded or filed in a public office, or a purported public record, report, statement, or date compilation, in any form, is from the public office where items of this nature are kept. (10) Methods provided by statute or rule. Any method of authentication or identification provided by Colorado Rules of Procedure, or by statute of the State of Colorado. (1) Domestic public documents under seal. A document bearing a seal purporting to be that of the United States, or of any State, district, Commonwealth, territory, or insular possession thereof, or the Panama Canal Zone, or the Trust Territory of the Pacific Islands, or of a political subdivision, department, officer or agency thereof, and a signature purporting to be an attestation or execution. (2) Domestic public documents not under seal. A document purporting to bear the signature in his official capacity of an officer or employee of any entity included in paragraph (1) hereof, having no seal, if a public officer having a seal and having official duties in the district or political subdivision of the officer or employee certifies under seal that the signer had the official capacity and that the signature is genuine. (3) Foreign public documents. A document purporting to be executed or attested in his official capacity by a person authorize by the laws of a foreign country to make the execution or attestation, and accompanied by a final certification a to the genuineness of signature and official position (A) of the executing or attesting person, or (B) of any foreign official whose certificate of genuineness of signature and official position relates to the execution or attestation or is in a chain of certificates of genuineness of signature and official position relating to the execution or attestation. A final certification may be made by a secretary of embassy or legation, consul general, consul, vice consul, or consular agent of the United States, or a diplomatic or consular official of the foreign country assigned or accredited to the United States. If reasonable opportunity has been given to all parties to investigate the authenticity and accuracy of official documents, the court may, for good cause shown, order that they be treated as presumptively authentic without final certification or permit them to be evidenced by an attested summary with or without final certification. (4) Certified copes of public records. A copy of an official record or report or entry therein, or of a document authorized by law to be recorded or filed and actually recorded or filed in a public office, including data compilations in any form, certified as correct by the custodian or other person authorized to make the certification, by certificate complying with paragraph (1), (2), or (3) or this rule or complying with any Federal or Colorado Rule of Procedure, or with any Act of the United States Congress, or any statute of the State of Colorado. (10) Presumptions under legislative Act. Any signature, document, or other matter declared by Act of the Congress of the United States, or by any statute of the State of Colorado to be presumptively or prima facie genuine or authentic. (11) Certified domestic records of regularly conducted activity. The original or a duplicate of a domestic record of regularly conducted activity that would be admissible under Rule 803(6) if accompanied by an affidavit of its custodian or other qualified person, in a manner complying with any Colorado statute or rule prescribed by the Colorado Supreme Court, certifying that the record- (A) was made at or near the time of the occurrence of the matters set forth by, or from information transmitted by, a person with knowledge of those matters; (B) was kept in the course of the regularly conducted activity; and (C) was made by the regularly conducted activity as a regular practice. A party intending to offer a record into evidence under this paragraph must provide written notice of that intention to all adverse parties, and must make the record and affidavit available for inspection sufficiently in advance of their offer into evidence to provide an adverse party with a fair opportunity to challenge them. (12) Certified foreign records of regularly conducted activity. In a civil case, the original or a duplicate of a foreign record of regularly conducted activity that would be admissible under Rule 803(6) if accompanied by a written declaration by its custodian or other qualified person certifying that the record- (A) was made at or near the time of the occurrence of the matters set forth by, or from information transmitted by, a person with knowledge of those matters; (B) was kept in the course of the regularly conducted activity; and (C) was made by the regularly conducted activity as a regular practice. The declaration must be signed in a manner that, if falsely made, would subject the maker to criminal penalty under the laws of the country where the declaration is signed. A party intending to offer a record into evidence under this paragraph must provide written notice of that intention to all adverse parties, and must make the record and declaration available for inspection sufficiently in advance of their offer into evidence to provide an adverse party with a fair opportunity to challenge them. RULE 903 Subscribing Witness’ Testimony Unnecessary The testimony of a subscribing witness is not necessary to authenticate a writing unless required by the laws of the jurisdiction whose laws govern the validity of the writing. To prove the content of a writing, recording, or photograph, the original writing, recording, or photograph is required, except as otherwise provided in these rules or by statute of the State of Colorado or of the United States. The contents of an official record, or of a document authorized to be recorded, or filed and actually recorded or filed, including data compilations in any form, if otherwise admissible, may be proved by copy, certified as correct in accordance with Rule 902 or testified to be correct by a witness who has compared it with the original. If a copy which complies with the foregoing cannot be obtained by the exercise of reasonable diligence, then other evidence of the contents may be given. The contents of voluminous writings, recordings, or photographs which cannot conveniently be examined in court may be presented in the form of a chart, summary, or calculation. The originals or duplicates, shall be made available for examination or copying, or both, by other parties at reasonable time and place. The court may order that they be produced in court. (a) Courts. These rules apply to all courts in the State of Colorado. (b) Proceedings generally. These rules apply generally to civil actions, the criminal proceedings, and to contempt proceedings, except those in which the court may act summarily. (4) Rules applicable in part. In any special statutory proceedings, these rules apply to the extent that matters of evidence are not provided for in the statutes which govern procedure therein. 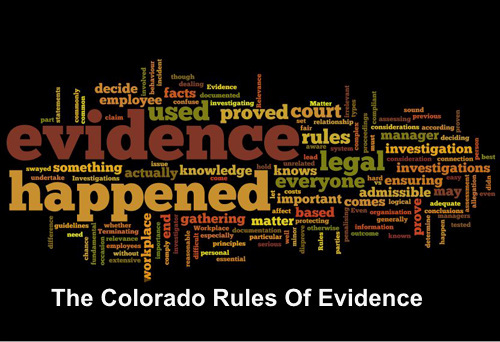 These rules shall be known and cited as the Colorado Rules of Evidence, or CRE.